at a library book sale in Arlington years ago. It was such an old copy that it even has a section on how to prepare game. I remember jumping past the part where it teaches you to skin a hare. Steve eventually bought me a new copy for my birthday that is much more up to date and reflects more modern cooking. It even has a recipe for naan in it that Steve used for a while. I learned a lot of basics Western cooking from The Joy of Cooking, like how to make a bechamel sauce and how to bake muffins and quick breads. But the most important thing I learned from the book was how to cook Brussels sprouts. 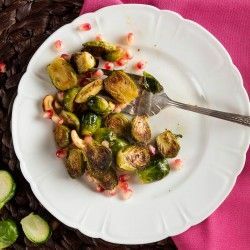 I had never made Brussels sprouts until I tried their Becker Brussels sprouts recipe and completely fell in love. 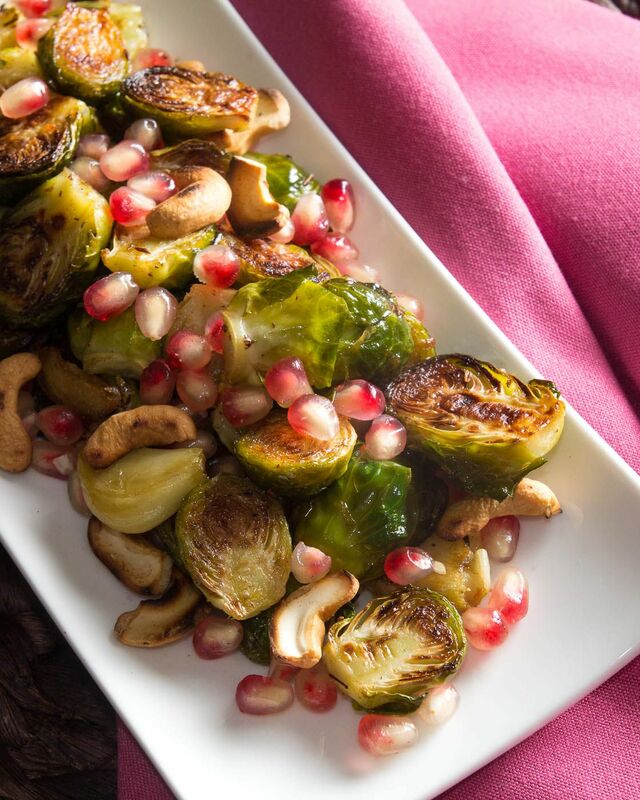 The Brussels sprouts were buttery and crispy and oh so delicious! I almost always make my Brussels sprouts this way. Sometimes I’ll change it up and add a few ingredients to them but the cooking method I use is usually the same. 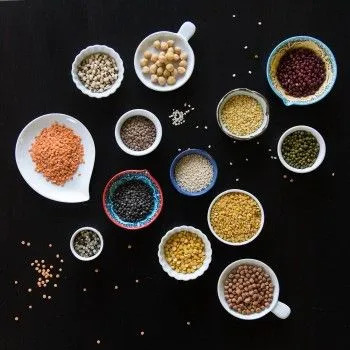 This year, I wanted to make some traditional Thanksgiving sides with an Indian twist. I had to make the Brussels sprouts first. 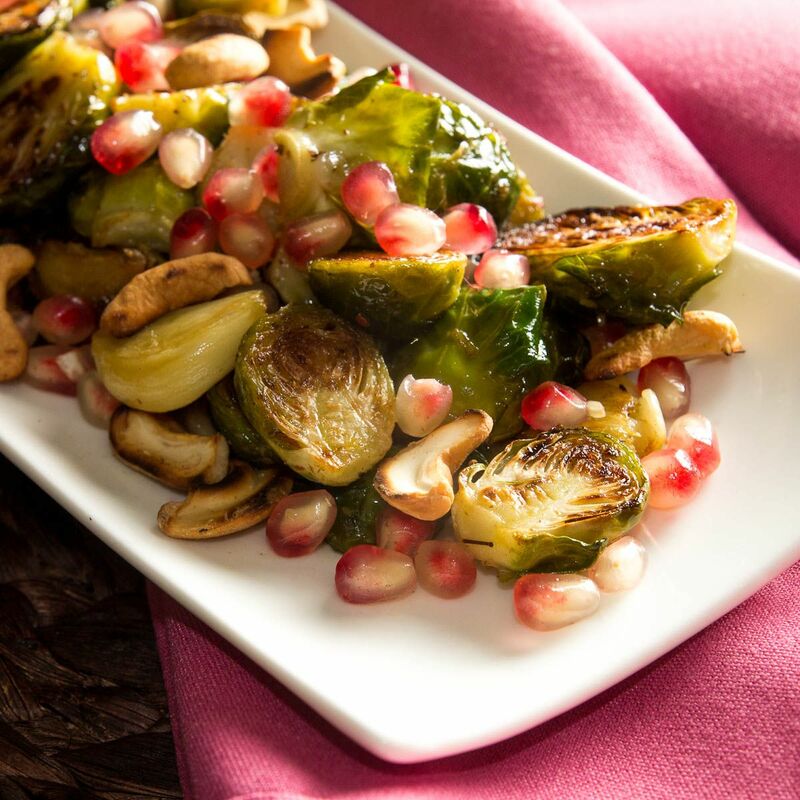 I love this delicious salad with pan roasted Brussels sprouts, pomegranate, cashews and a cumin vinaigrette. Heat the ghee in a 12 inch skillet over medium low heat. Add the garlic cloves and stir. Add the Brussels sprouts to the pan making sure they are all placed with the cut side down. Cover and cook for 10 minutes. After 10 minutes are up, take off the lid and let cook for 5 to 8 more minutes uncovered. 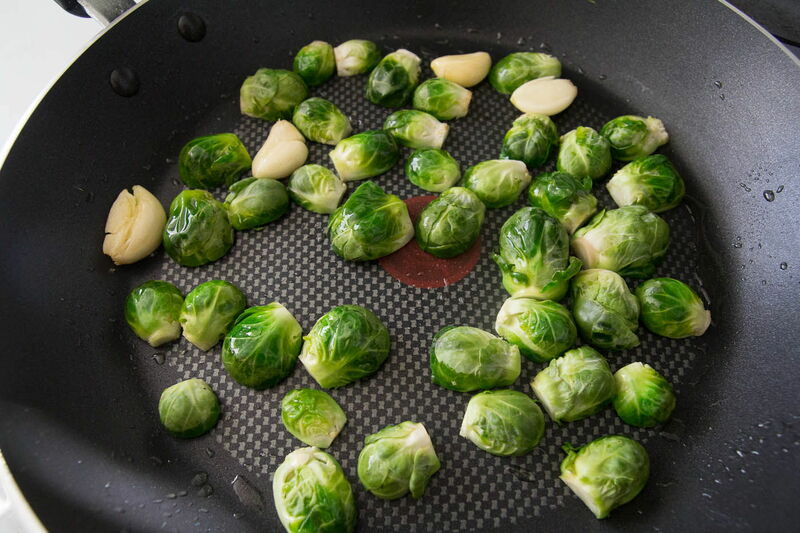 Do not stir the Brussels sprouts. Turn off the heat when Brussels sprouts are soft and the cut sides are golden brown. 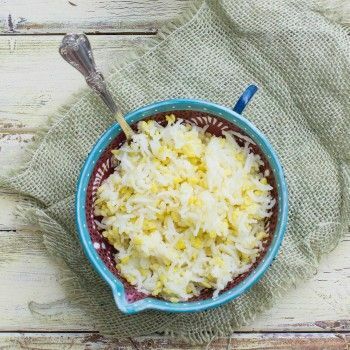 In a small bowl, whisk together the lemon juice, olive oil, lemon zest, salt and garam masala. Toss this mixture into the pan with the Brussels sprouts and stir. 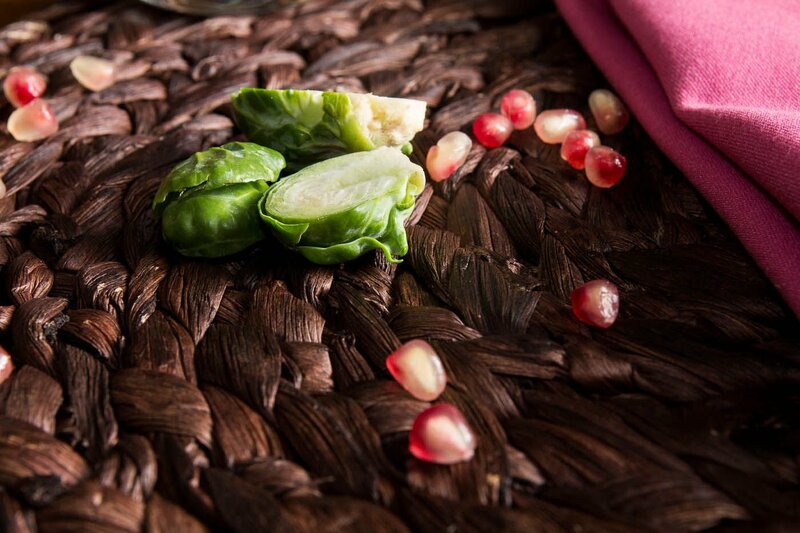 Add the pomegranate and cashews. Serve warm or at room temperature. The original recipe calls for cooking the garlic for a minute or two and removing the garlic cloves before adding the Brussels sprout. I prefer the let the garlic cook with the Brussels sprouts. I like the crispy garlic cloves that you end up with. 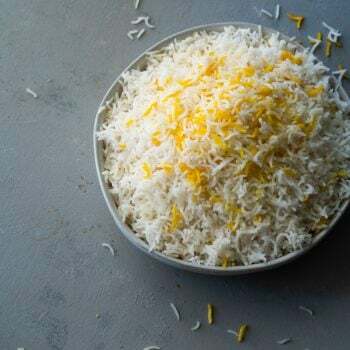 The original recipe also calls for a lot more butter or oil. I’ve cut it way down because I don’t think it’s needed. 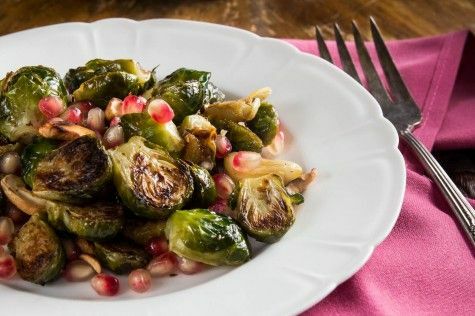 Comments on "Pan Roasted Brussels Sprouts with Pomegranate Salad"
I can eat Brussel Sprouts all day long, your recipe looks delicious!